This fantastic interview with Emily Maye started just after the Spring Classics and the AToC. For various reasons: 70% website changes, 35% Tour de France interruption, 10% USADA drama, and 89.2% procrastination—I’m finally publishing it. In the meantime, Emily’s exposure has blown up and she’s now charging for interviews. Luckily this was conducted well before the fees were introduced (joking). Emily exemplifies what I’m looking for in a “5 Questions” photographer. 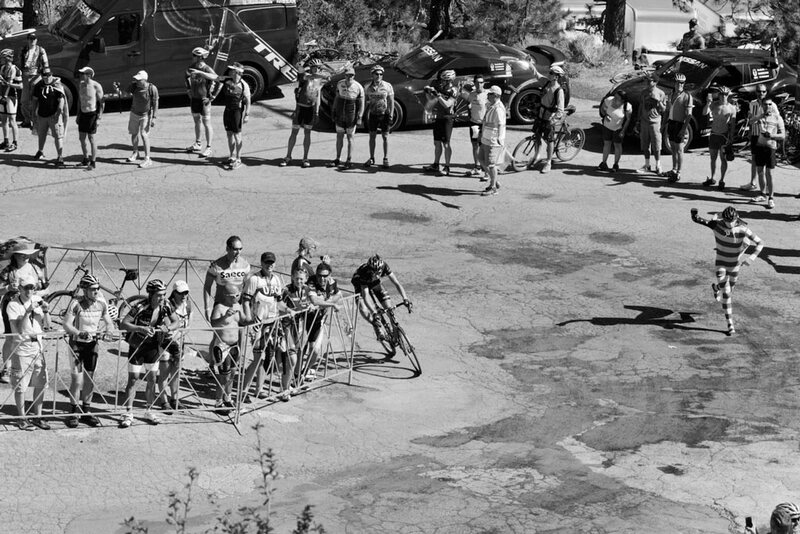 Her ability to capture the essence and atmosphere of bike racing is astounding. Enjoy these 5 (or more) questions with Emily Maye. 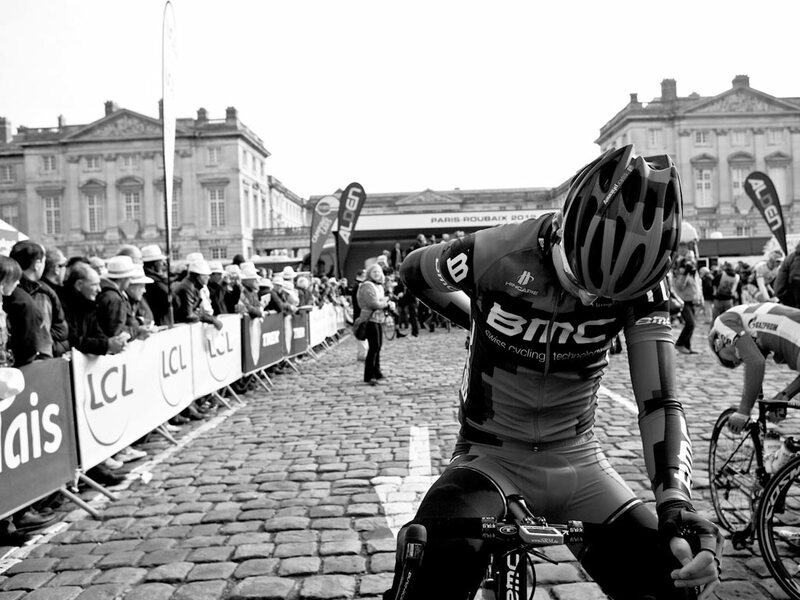 I took this photo of Taylor Phinney at the start line for the 2012 Paris-Roubaix. It was still early and the riders had not fully filled in the start area and Phinney was by himself near sign in. He then moved to get in line where he is in the photograph, right by the first row of riders. He then pulled a pastry from his back pocket and ate it. 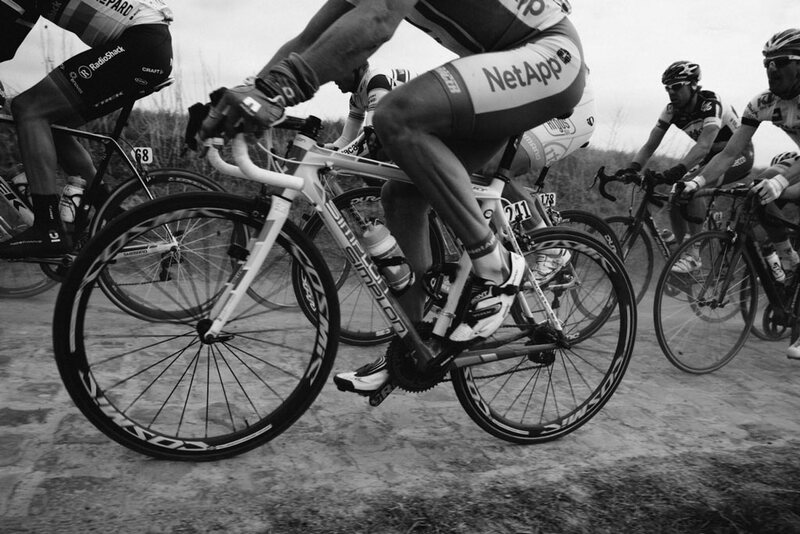 He won the U23 Paris-Roubaix in 2009 and 2010 and this was his first attempt at Roubaix on the pro level. All of that factors into the photograph. The fans on the side, his isolation as a solitary figure and a bit of a sense of nervousness and expectation. I really liked all of that about the moment. It’s such a daunting race and the waiting to start has an uneasy mood to it. That’s part of its magic. What got you interested in photographing cycling? The immense love that I had for cycling. Not just watching the races but all of the lifestyle surrounding it, the history of it, the design and colors, and the incredibly different personalities of the riders. I also fell in love with old cycling photographs. I had been photographing for a long time and studied cinema in school so I had developed a style and I really wanted to see how that would work with cycling because I had been mostly photographing ballet dancers. It has been a challenge and so so rewarding. There are all these photos in my head that I want to take in cycling and when I get one that fits that I am very excited. So many circumstances that have to come together in order to get one of those shots. What are your favorite cameras/lenses for shooting races? I mostly use the 5D Mark II and lately I’ve been a big fan of the 28mm f2.8. I also use the 70-200mm f2.8 version II. The 50mm 1.2 comes in handy for indoors, inside the buses or hotel rooms where there isn’t a lot of light. It’s a beautiful lens but impractical in race. I don’t like too wide of lenses because of the distortion they create. I don’t want the lens to be part of the picture, in fact i’d prefer that you never even thought that a photographer was there in the first place. I used a second body this year but I would like to get away from using one if I can. It distracts me. I also just got back from shooting the Amgen Tour of California and I used an instant camera throughout the tour. I limited myself to 20 instant photos a day and they were really fun. I use my iphone a lot but not so much at races. 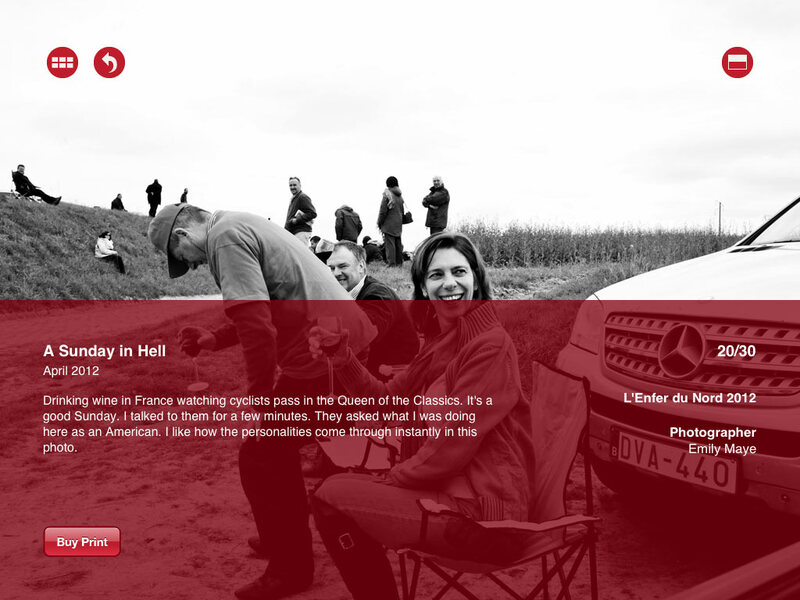 I used the Hipstamatic Disposable Camera a lot in France during Paris-Roubaix recon and surrounding events. I put them into a folder, and sort through that folder in Adobe Bridge by starring anything that I like. For some reason I always star them a 2 and then if I really like something a 5. There’s maybe one 5 on a day if I’m lucky. That’s always really exciting. No idea why I decided on 2 but now it’s computer muscle memory and I don’t change the habit. Then I move those images to a folder of “selects.” From there I organize in Lightroom which is so so slow. I try to wait as long as possible in the day to look at the photos which always means for late nights trying to get them in. With the Spring Classics I didn’t even want to look at them until at least 36 hours later. I really like selecting photos, I just want to have more objectivity than I do on the day of shooting. That is not practical in most cases. Often times the photos are needed that night. Any tips for capturing the perfect cycling shot? In my opinion, emotion. I also want to see cycling photographs that give me something that I don’t get from television coverage, a unique framing or angle or something that is really captured in time that is worth looking at for longer than it happened before your eyes. Taking one photo can often mean that you missed another so you have to be calculated about what you are after. And happy accidents always happen too. You have to keep your eyes open for that. As far as technical tips, knowing where your focus point is going to be really helps. They come at you pretty fast and focusing, for me anyways, is the primary obstacle for getting what I intended. If you can do all that and there is emotion in the photo and you feel something looking at it, then those are keepers. 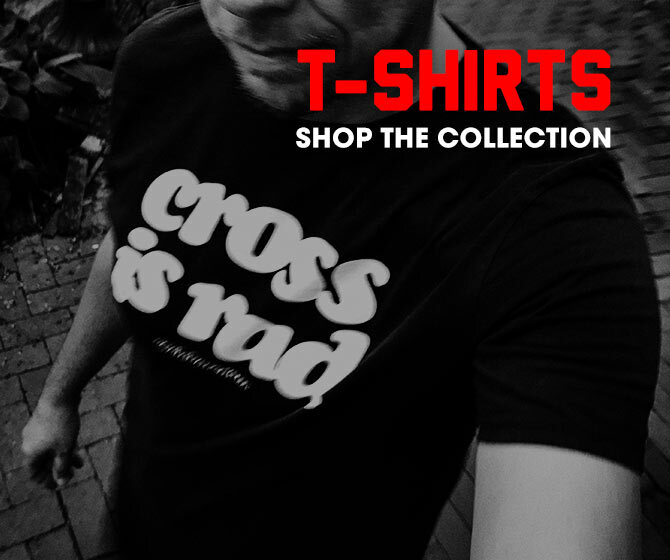 Bonus: You had an eventful Spring Classics covering both De Ronde and Paris-Roubaix. 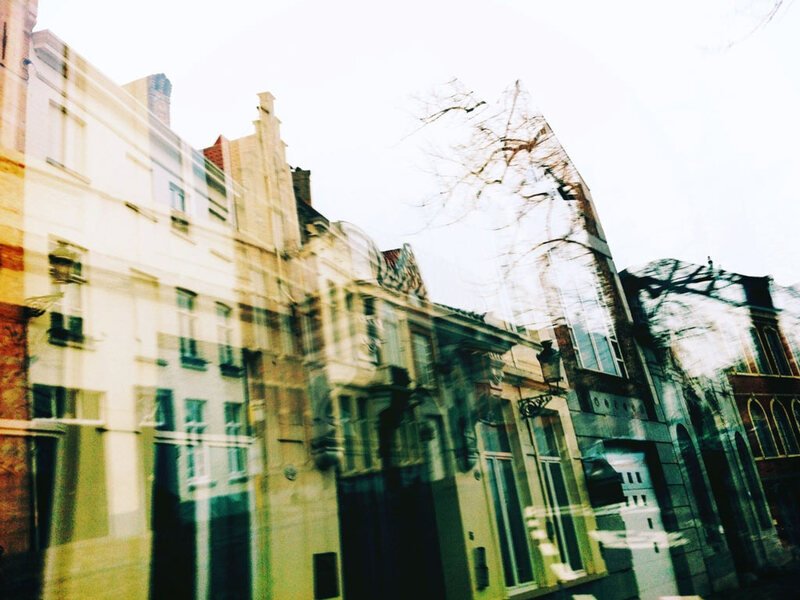 Can you tell us what image(s) defined that trip for you? It was my first time covering the European races so it was quite eye-opening. 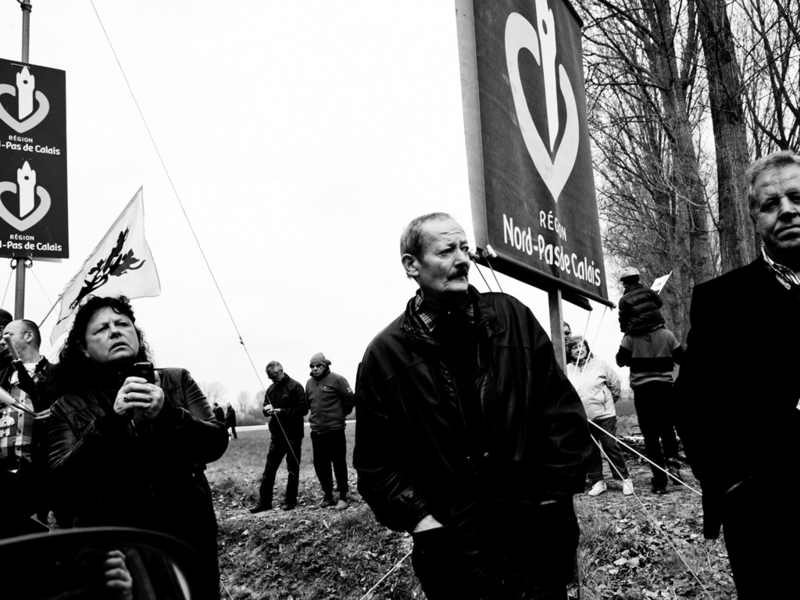 As an American in Belgium & France covering the two biggest Spring Classics, the energy of the fans was most defining. I hadn’t seen that level of spectator viewership here. The passion that the fans have for the race is wonderful. It was inspiring to photograph, as I am sure it is for the riders as well. The non-race photos that I took while doing recon on the routes meant a lot to me personally because I was so excited to be there. I would drive the routes alone by myself and sometimes stop the car every 20 seconds. I kept thinking, man at this rate I will have to come back for several days, I should just go. And then I’d see something and want to stop and have to put the car in reverse. During the races, some of the pictures of fans became the defining images for me. They embody the heart of the event. Bonus: You also covered the Amgen Tour of California this year. What image(s) defined your experience? Yes, that was a very different experience. 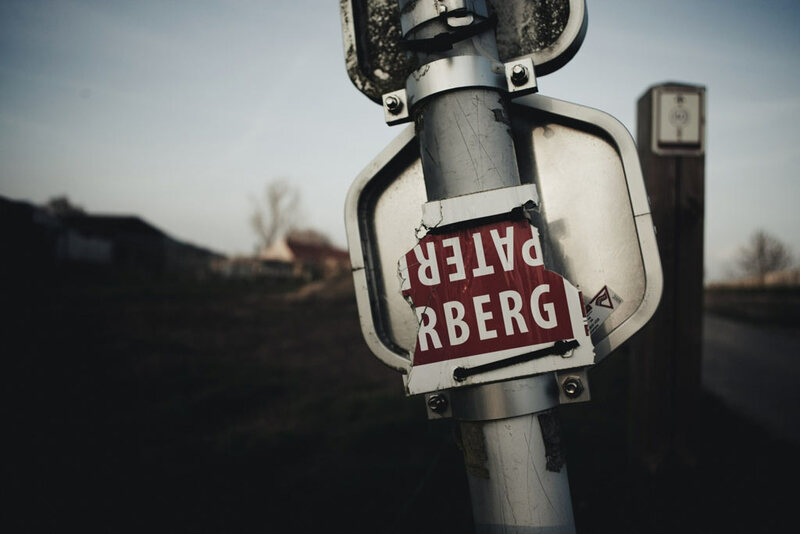 I covered the Tour of California as the photographer for the Bontrager Livestrong Team and covering the race from within the team has different objectives than covering it for another purpose. So within that framework I’d have to say the photos of Joe Dombrowski after the 4th place finish on Mt. Baldy were a big part of the narrative of what I was documenting and were very exciting. I really love all the things that happen behind the scenes of races and so having the opportunity to photograph those was really what the race was about to me. I’ve purchased a couple of your sets on The Collarbone. How has that experience been? It has been cool to be a part of theCollarbone and I am honored to have the sets on there. It has opened up my eyes a bit to the benefit of captions on photos. I think saying something with them can really help understand what you are looking at and also help see the larger narrative of the race. I like that format a lot. The iPad apps and iPad magazines are certainly an interesting development in how you communicate with people. The photos really pop in that form as well. Laatste Ronde: What’s Next for You? I just finished photographing my first cyclocross race (and first night race) at CrossVegas and this next week I will be covering the US National Track Cycling Championships. It has been a year since doing any track and so I am excited to see the results. 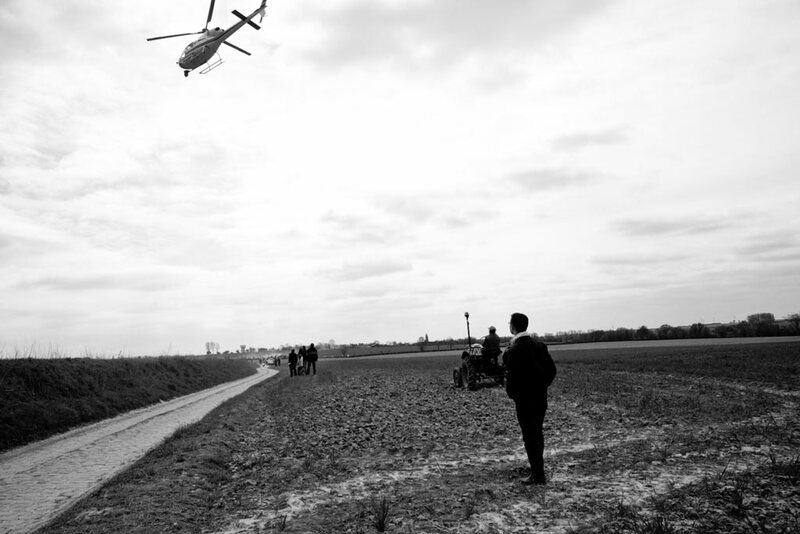 I’ll then be heading to Belgium to see the cyclocross scene over there and photograph during the holiday races. I have a featured section in the second issue of the beautiful dutch magazine Soigneur and a nice spread in The Ride Journal Issue 7. Recent CrossVegas work. Guess who’s good at night shots? See more of this fantastic set.